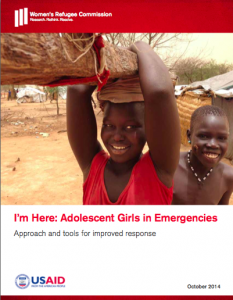 I’m Here: Adolescent Girls in Emergencies, a report from the Women's Refugee Commission, is a resource for emergency response staff. Adolescent girls are at a comparative disadvantage, with unique needs and subject to particular protection risks; findings suggest that emergency responses do not account for how their routines, roles and assets shape their abilities to safely access vital resources. This report outlines an operational approach and recommendations that can help humanitarian sectors be more accountable to adolescent girls from the start of an emergency. Key rationale, findings and recommendations are based on a literature scan, expert interviews, and a field assessment and pilot testing of mobile-based tools in South Sudan. Each section begins with a summary of key findings and messages, followed by supporting information. Annexes contain supplementary material and tools. Read more here.